Okay, so this photo sort of gives the impression of Siamese twin babies or something-- oops, my bad. I can assure you my friend whose shower I attended Saturday is not having twins. 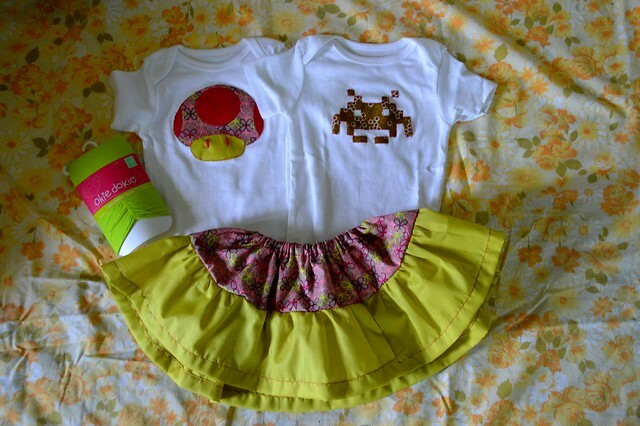 I whipped these appliqued t-shirts (9 mos size) up last week the same way I did these onesies years ago, except this time I was smarter and gifted something that'll get worn more than once. 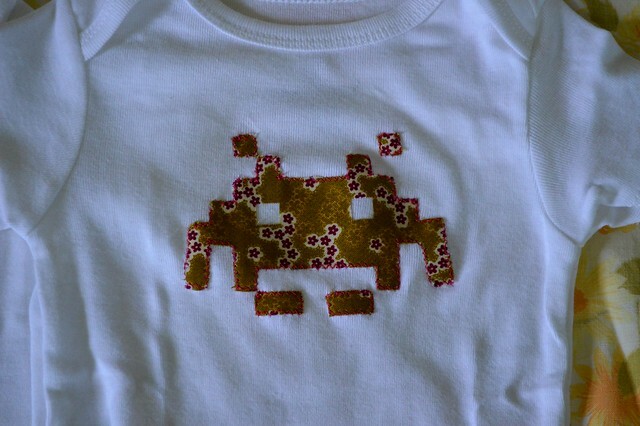 The mom-to-be is a great fan of all things nerd-- Star Wars and Dr. Who and old school video games-- so all it took was a quick snoop around her Pinterest board for the new baby to come up my designs. 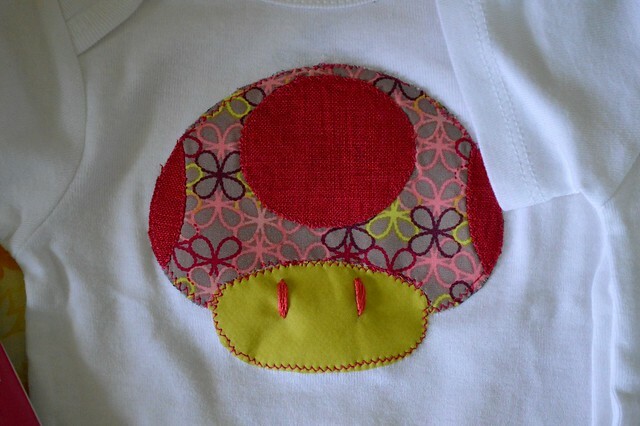 The mushroom from Super Mario Brothers. The alien dude from Space Invaders. To round it out, I threw in a pair of green footless tights (Mom is pretty steadfastly anti-pink, which I knew) and sewed up a quick Layer Cake Skirt to match. So much fun! The shower itself was a surprise, and I was the one tasked with picking up the guest of honor for a day of "yard saling," then driving her to the park across from my house for the shower. She was duped, we all were smug, the whole thing went off without a hitch. This is shaping up to be a very exciting week for us. Turns out Dale wasn't returned-- he was just taken off hold by a woman who'd been on the fence about him. We have been busting hump all weekend trying to get our lawn invisible-fenced (800 linear feet, baby! ), and today when we went out to buy more wire for the fence, we stopped and bought a collar, and a duck chew toy, and dog food. Again. I'm driving to Delhi to pick him up tomorrow. I am making the most of this opportunity to be sentimental. Patrick and I sat across from each other at a bar Friday night, brainstorming names. Dale isn't a bad name, and, well-- it does suit him-- but it's just a tad on the NASCAR side for us, you see. He's very laid back, and also a bit of an airhead, it seems, so we wanted something appropriate. We thought about Southern airhead names like Bubba and Dwayne and Amos, and we thought about Irish names that might fit, like Seamus. Then I started thinking about Fargo, because this dog has a Fargo sort of face. And so eventually we settled on Delmer Lundegaard Strain, and I simultaneously burst into a laugh-cry over my gin and tonic. Perfect. I am so overwhelmed by excitement, but I'm trying to hold myself back a little, trying to remind myself that though he has the makings of a great dog, I will likely be cleaning up after him and wiping off his slobber and vacuuming up his sheddings for many years. Even great dogs shed, and slobber. But those nerve endings in my heart are starting to grow back after many months, and this guy had me at woof. Yay!!!!!!!!!! Welcome hugs and kisses to Delmer! Can't wait to see pictures.